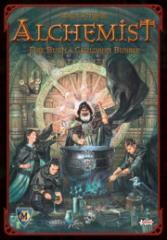 It is the Contest of the Alchemists! The most talented Adepts of the mystical arts come from around the world to compete. They fill their cauldrons with exotic and rare ingredients, all creating new potions in the quest for fame and honor. In addition to demonstrating their talents by replicating their fellow competitors' potions, each has a secret agenda: to promote the use of the component their school of magic prizes most highly! The person who brings the most fame to his or her school—and for themselves—will win the title of Supreme Adept!